When most people think of Berlin, they think of the wall and the horrors of WWII, but this is also a city with a long and fascinating history of art, fashion and the avant garde. Berlin boasts a veritable treasure trove for lovers of art and antiques, and for those interested in vintage clothing – a unique, affordable and sustainable alternative to many modern labels – there is much to explore, including Toast and Jam, the famous vintage fashion fair that runs twice a year. But with trendy secondhand clothing stores now popping up on every corner, enthusiasts can easily get the impression that the ‘vintage’ shops in Berlin are simply resting places for jumbled racks of cheaply made 90s castaways. Make no mistake, Berlin has some of the most exceptional vintage boutiques in the world, with quality collections that have been lovingly and painstakingly acquired over many decades. You only need to know where to go. Step back in time in this small and immaculate shop packed with rare vintage finds dating from the 1920s to 1950s, with particular emphasis on the 1940s. Glencheck has been open for over 20 years, and has a lovely collection of vintage children’s clothing, including unworn 1950s checkered shirts still in their packaging, an impressive collection of 40s women’s shoes, hats for men and women, handbags, suits, blouses, dresses and more. I bought a stunning 1940s handmade red check cotton dress with mother of pearl buttons – worth every penny at 125 Euros – and a classic straw and bamboo 1950s handbag for 48 Euros. Both pieces are in rare, immaculate condition. Constanze Pelzer really knows her vintage and is happy to help. This shop is packed with 40s perfection. Highly recommended. Above: Berndt and Sapphira outside Glencheck, on Joachim-Friedrich Straße. 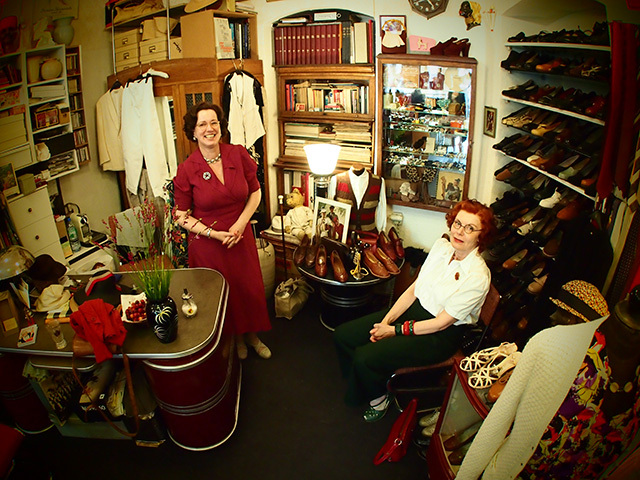 Above: Shop owner Constanze (at left) and friend in Glencheck, dressed to 1940s perfection. 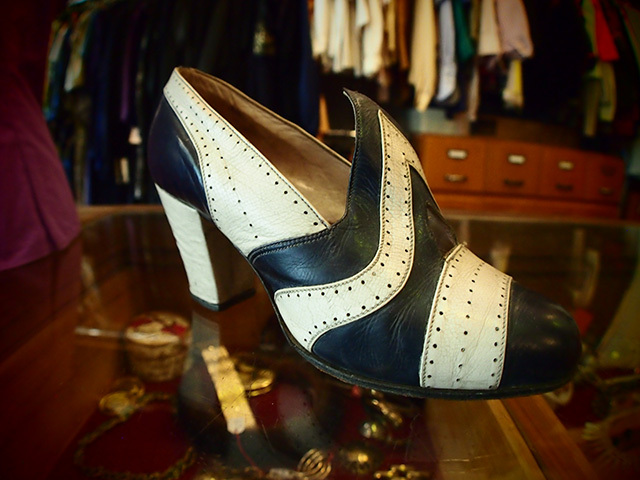 Above: Possibly the most beautiful 1940s shoe I have ever seen. At Glencheck, Berlin. 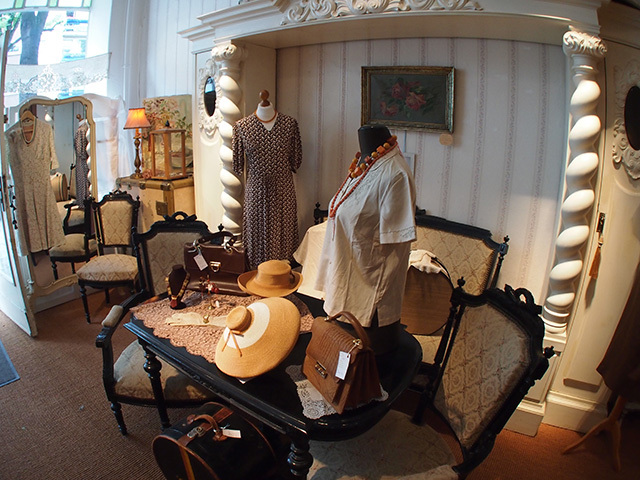 Mimi has a stunning collection clothing dating back to the 1800s, but with particular emphasis on the 20s and 30s. This shop is immaculately organised and very affordable. Without much time to spare, you can find a perfect vintage dress on their well displayed racks, and leave having spent under 50 Euros. While you are in Schöneberg, admire the Weimar mansions on many of the streets and stroll past Leberstrasse 65, where Marlene Dietrich was born on 27 December 1901, or better yet, for 20 Euros get a walking tour with vintage lover and history major Lucia Vicente. (See below for more). Above: Immaculate racks at Mimi make the perfect – and affordable – dress easy to find. Last but certainly not least, make sure you visit Spitze, nestled amongst the fascinating antique shops of Suarezstraße. This shop has been running for over 40 years, and has a truly awe inspiring collection of garments from the 1860s to the 1960s, organised by era and colour. 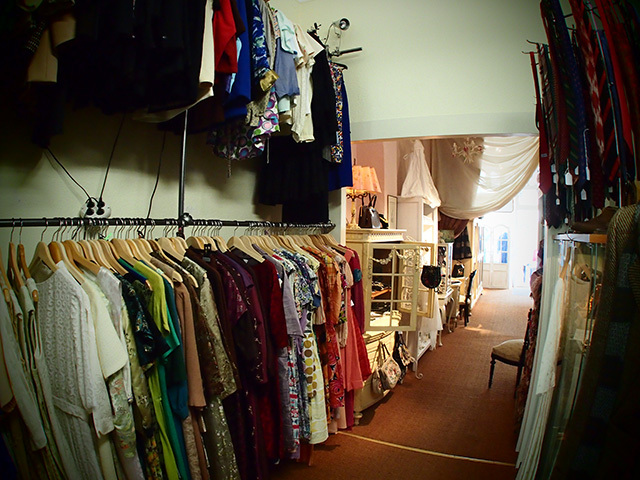 Just when you think you’ve seen it all, ask Axel to show you into the back rooms, which are packed from floor to ceiling with immaculate vintage garments, from 40s ration fashion (food wasn’t the only thing rationed during WWII) to leopard coats and silk stockings. A truly remarkable place. 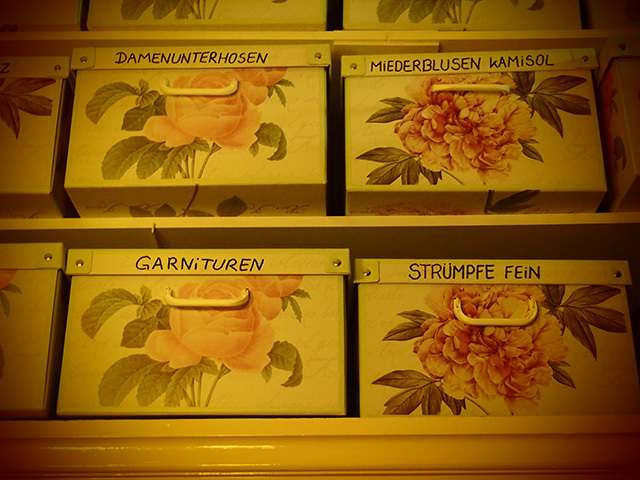 Above: Labelled boxes of vintage in the back rooms at Spitze. Above: With Axel Noltekulmann at Spitze, Berlin. One memorable and fun way to take in the best of vintage Berlin is to go for a walking vintage tour with Lucia Vicente (pictured below). 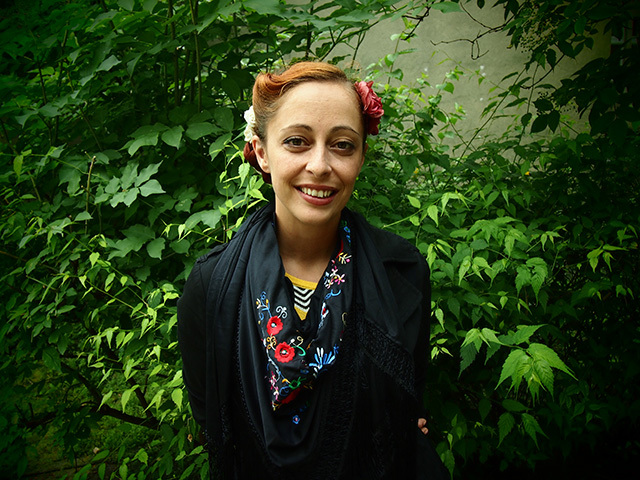 Lucia speaks English, Spanish and Portuguese, has a degree in history, has worked in cabaret and is passionate about Berlin history. For only 20 Euros per person, she will take you on a four hour personal tour of historic landmarks and genuine vintage boutiques, including all of the shops I’ve listed above, and more. Her tours are casual in feel, operate by foot and UBahn (Berlin subway) and are adaptable to your individual interests. We enjoyed her tour of historic Schöneberg, which is off the beaten track for tourists, and is home to some fascinating history and vintage stores including her favourite, Mimi – Textile Antiquitäten, where she found her top vintage find: a new pair of black shoes from the 40’s for only 40 Euros (about $55 AUD). 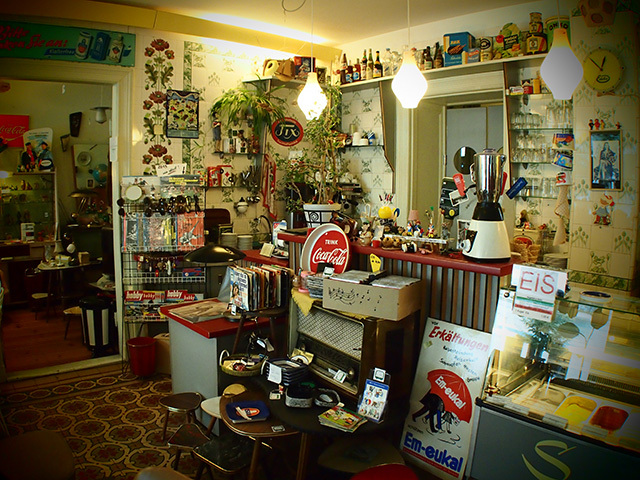 Put on your best vintage walking shoes and take a spin around Berlin with a fellow enthusiast. Finally, once you are famished from all that walking, marvelling at Berlin’s colourful history, and hunting for unique vintage to take home, head to Sorgenfrei (pictured below) for some retro cuisine comforts. Order the Toast Hawaii for a real 50s moment, and soak up the upbeat 50s and 60s vintage atmosphere. Each of the boutiques I have listed offer genuine vintage at a range of prices, correctly listed and organised by era, size and price, so you really know what you are getting. Never before have I found such stunning collections of fashion history outside museums. These spots need to be seen to be believed. * Photographs copyright of Tara Moss & Berndt Sellheim, 2013. * Related: Hate the way modern fashion treat your curves? Go retro. The last time I was in Berlin a couple of years ago I stayed in Kreuzberg and had a blast. Your post makes me want to go back there again :). I’m so glad you enjoyed the post, Steph. The vintage scene in Berlin really impressed me. The historical knowledge and the care they put into their collections was like nothing I had seen before. A wonderful city to visit, and particularly for vintage lovers. I saw a side to Berlin I had not previously experienced. Wow so much beautiful retro gear. I tried to get to Berlin when I travelled but unfortunately didnt. After watching the Underbelly Razor series I am so back into collecting which I gave up when had the child. I have so much bric a brac, now I want the clothes, hats, shoes etc etc etc.as i have the curves now etc etc.So cant wait to go back OS again and I hope those shops are there still.